A 100-year-old woman in Miami said she woke up to find an animal on her chest, according to a veterinarian caring for the unusual creature. "I was awaken by a phone call at 2 a.m., which is never good news, and it was from my terrified mother-in-law," said Carlos Aguaras. Aguaras said he rushed over, and found the animal that had terrified his mother-in-law. The only other person in the home at the time was her live-in caregiver. 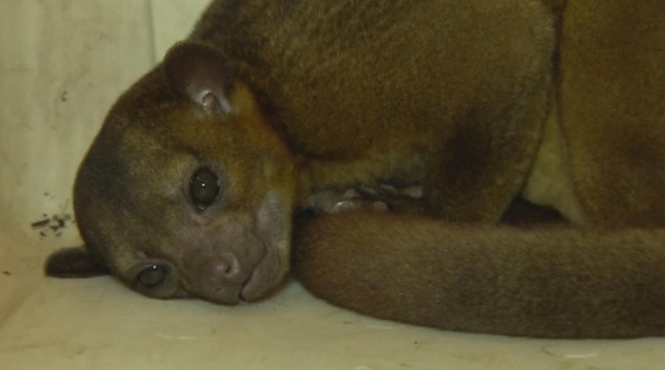 It was a kinkajou, an animal usually found in the rainforests of Central and South America, said Veterinarian Dr. Don J. Harris, who works for the South Dade Avian & Exotic Animal Medical Center. The animal, whose name is Banana, was being cared for at South Dade Animal Hospital, where the medical center operates. There's no word on how the animal got loose, but the woman's family has a message for the owners. "Put it in the hands of the experts, but it's not intended to be a pet in a home," Aguaras said. Kinkajous typically spend most of their time in trees. They have the ability to turn their feet backwards to run easily in either direction, along branches or up tree trunks. Kinkajous also often hang from their tails. According to National Geographic, they are sometimes called "honey bears" because they raid bees' nests by slurping honey from the hive. Responses to "100-Year-Old Woman Wakes Up To Find Unusual Creature On Chest "
Hate to see any undomesticated animal as a pet. so sad , the endings are nearly always bad. The first question should be what is this wild creature doing in Miami as a pet and not in its natural habitat? lets leave the animals alone where they can be happy in their environment, there are plenty of dogs and cats at the humane society waiting to be adopted, those are the best pets! He looks so sad..... Give him a blanket or something. The owner should be ashamed. One for having him as a pet and two for not taking care of him/her properly.